27 Jan : Shri Samwartak Singh, Director Tourism and Director Schools, Chandigarh Administration has inaugurated the Junior and Senior State Baseball Championships 2008-09 of boys and girls on 24th January, 2009 at the Punjab Engineering College Sector-12, Chandigarh. Total 32 teams have participated in the state championship. Shri Tilak Raj Kaila General Secretary of the Association has told that the medals and trophies will be given to the winners, runners up and third place teams of all sections of junior and senior. He also told that Chandigarh Baseball Teams are also going to participate in the 23rd Senior National Baseball Championship to be held at cuttact,orissa from 30th January, 2009 to 3rd February, 2009. • 9 Famous club beats 46-Club by 4-3 score. For winning team Sanya scored 2 homes and Mukesh and Suresh scored one home each. • In another match New Nine Famous Club recorded one sided win over GMMSSS-42 by 11-1. • Amit, Sumit, Vipin, Deepak scored two homes each for the winning team. • Leisure valley Club also recorded one sided win over 47-Club. The final score was 11-0. • 36-Club recorded win over DAV – 8 with 3-2 score. • In semi final matches Nine Famous club beated Leisure Valley club by 4-0 and entered into finals. • In Girls section Nine Famous club beat GHS-11 by 8-5 score. Shakuntla scored 2 homes. Neha, Monika, Anjali, Nitasha and Nisha contributed one home each for the winning team. • Leisure valley club beated GSSS-15 by 2-1 score. • In another match GMSSS-23 recored a close win over GMSSS-8 by 11-10. • New Nine famous club beated GMSSS-10 by 4-2 score. • In senior section Rising club has recorded a marvelous victory over striker club. Rising sun beat striker club by 4-1. • Ravinder, Davinder, Vijay and Vikram contributed one home for the winning team. Whereas only Sunder Lal get success score one home for the losing team. • In another match Nine famous club beat New Brighter Club by 3-0.Amit Pankaj and Ashish scored one each for the winning side. • Leisure valley beat Punjab Engineering College by 4-0 score. Ravi scored two homes for the winning team. • In women section nine famous club beat GCG-11 by 11-1. For winning team Sarita, Hema, Puja, Shakuntla and Anjali scored two homes each whereas Rupa scored one score for the GCG-11. • GSSS-15 recorded a close win over GMSSS-8 by 3-1. • In another match GGSSS-23 recorded 5-2 wins over New Nine famous Club. 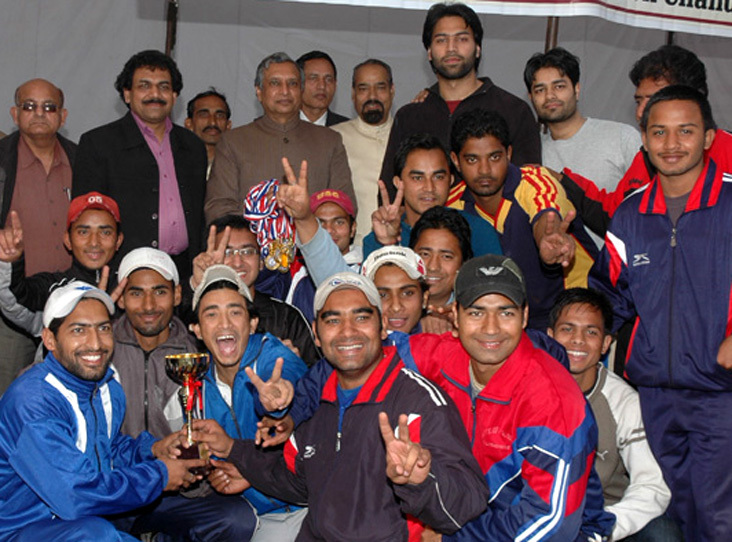 Shri R.N Prasher, IAS, Financial Commissioner and Principal Secretary to Government of Haryana, Irrigation Department has given away the prizes to the Runners Up and Winners teams in the Junior and Senior State Championship 2008-2009 held at Punjab Engineering College on 24th, 25th and 26th Jan 2009. Dr. M.L Gupta Dean of Punjab Engineering College and Shri Jaspal Singh gave away the prizes to the third position teams of Boys and Girls. GMSSS-23 beat GSSS-15 by 7-6 for third position. In the final match Nine Famous Club beat GMSSS-10 by 22-8 won the trophy. Leisure Valley beat 36 Club by 5-4 for third position. In the final match Nine Famous Club beat New Nine Famous Club by 12-3 and won the trophy. GSSS-15 beat GMSSS-23 by 15-4 for third position. In the final match Nine Famous Club beat Rising Sun Club by 3-2 and won the trophy. Leisure Valley beat Youth Club by 10-3 for third position. In the final match Rising Sun Club beat Nine Famous Club by 4-0 and won the trophy. In Junior Boys section, Shivraj score homerun and in Senior section Vikram score homerun. Sammir Dattani in Shyam Benegals next movie.